The photographs below probably don’t do this job justice but in summary recent high winds had dislodged tiles from the roof adjacent this conservatory at a house in Oldham causing them to smash through the glass roof and damage the Travertine Tiles on the floor below. The first job was to wash the floor down with Tile Doctor Pro-Clean to give it a general clean and remove any surface dirt and grit from the floor. 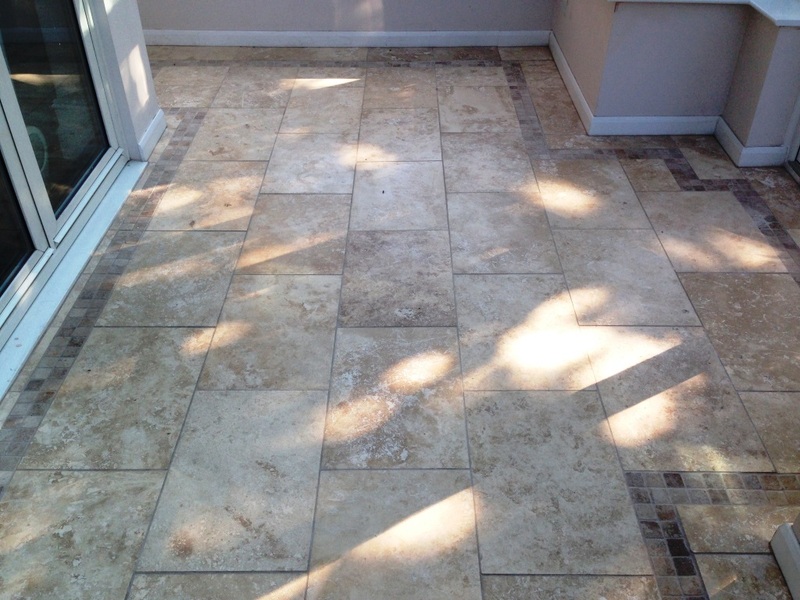 Travertine is a very hard stone so to restore the finish it needs to be cut back and polished using of a set of diamond encrusted burnishing pads fitted to a rotary machine. You start with a coarse pad with a little water, then a medium pad, fine pad and finish with a very fine polishing pad, this takes some time but the effect it quite transforming, it does build up slurry on the floor so it all needs to be washed down again at the end. I use a wet vacuum to remove the liquids from the floor and this also gets the floor quite dry. I then filled the holes in the damaged tiles using resin cement that matched the colour of the Travertine. I let the floor dry fully overnight and came back the next day to seal the tiles checking first with a damp meter that the floor has dried. 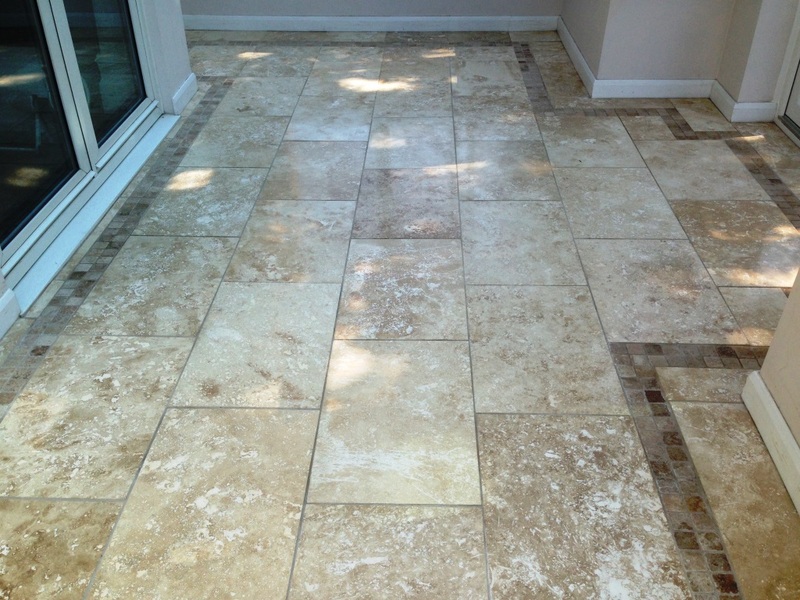 A sealer is highly recommended for natural stone as it protects the stone from staining and keeps it looking good for longer. For this floor I used coats of Tile Doctor Colour Grow which is a colour enhancing sealer that brings out the colours in natural stone, it’s also an impregnating sealer that soaks into the pores of the stone and preventing dirt becoming ingrained there. Once the sealer was dry it was buffed using a white buffing pad to make sure that I hadn’t left any residues from the seal. The job took two days to complete and the customer was very happy with the final finish and the fact that you could not tell where the damage had been. I contacted Kamila as Ive recently moved to a new house and wanted my bathroom floor tiles cleaning/polishing. It was obvious that the previous owner hadnt used the right products on them as they looked dull. Kamila arrived on time and got straight to work, she is a lovely person and very professional. She has made my tiles look brand new, I cant believe the difference. She also gave me some advice on how to treat and clean my floor in the future. I will definitely use Kamila again and wouldnt hesitate recommending her to friends and family. Kamila is by far the most polite, reliable, and conscientious professional we have ever had working on our house. We are delighted with the results of her work. Kamila made a wonderful job cleaning my grout and silicone. The bathroom looks like new. She was also easy to deal, very friendly and professional. Thank you! Our bathroom looks like new again. Very pleased with the work carried out by Kamila. Thank you for making my bathroom look new again! Kamila did an excellent job and was extremely professional, knowledgeable and friendly. Wouldnt hesitate to recommend.